. Published on January 19, 2018 . 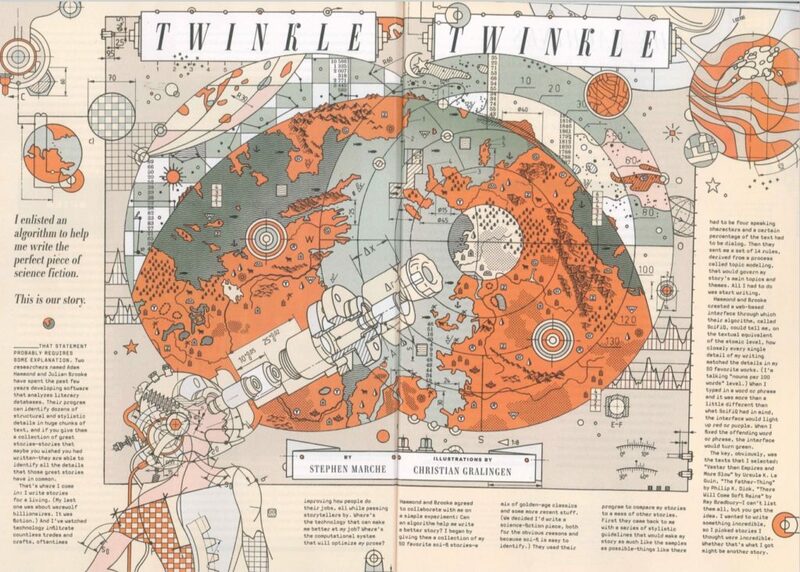 In December 2017, Wired magazine published a story by Stephen Marche called “Twinkle, Twinkle.” Julian Brooke and I were involved in the creation of the story, which was written with the help of our “algorithm” (actually, of course, a whole bunch of algorithms, some of them ours, some of them not.) In the coming months, I’m going to put together some talks and essays reflecting on the process and goals of the project — but for now, suffice it to say that we supplied Marche with fourteen thematic “rules” and developed an interface that would force him to meet 24 stylistic targets (you can get a rough sense of how this worked from the footnotes Marche supplied to the story). CBC Radio’s program “The Current” did a half-hour story on “Twinkle, Twinkle” in January 2018. You can read the transcript and listen here.